If you're suffering from an addiction to Dexedrine -- a prescription medication used to treat people with attention deficit hyperactivity disorder (ADHD) -- it's important to know that you aren't alone. According to the U.S. National Library of Medicine, the drug is habit-forming. Many people feel like they need to take the medication in larger and larger doses as they build a tolerance, which eventually leads to addiction. Dexedrine rehab centers help people recover from their addiction and regain control of their lives. If you're suffering from an addiction to Dexedrine and would like more information on various types of treatment, call 1-888-341-7785. Once you've decided that you want help for your addiction, you need to decide what type of program is best for you. People use either an inpatient or an outpatient treatment program to recover from Dexedrine addiction. Some health insurance policies will pay for all or part of your treatment. If you don't have health insurance, you can talk to the staff at the Dexedrine treatment facility to determine what payment options or financial assistance programs are available. Outpatient treatment programs give you more flexibility. These programs allow people to work full time while they recover. You are also able to be at home every night with your family. Outpatient treatment programs are good for people who have a stable support system at home and won't easily succumb to temptation. Inpatient rehabilitation facilities require patients to live at the facility for the duration of their treatment -- typically 30, 60 or 90 days. All inpatient Dexedrine rehab centers keep all of your information confidential. Some facilities even give patients private rooms, instead of shared rooms. If you are sick and tired of your addiction and determined to stop using Dexedrine, then you're ready to commit to a rehab program. While it's your choice whether or not you use an inpatient Dexedrine rehabilitation center or an outpatient program, some people need a more structured environment to recover and inpatient programs work best. 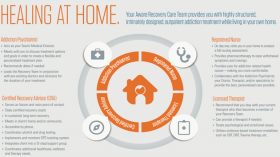 Residential rehab facilities give you a recovery place that's free from temptation. According to the A.D.A.M. Medical Encyclopedia, addiction occurs when a chemical dependency is combined with a compulsive desire to consume a substance. If you have a compulsive desire to use Dexedrine, then you might have an easier time recovering if you use an inpatient program. If you need help finding an inpatient Dexedrine rehab center, call 1-888-341-7785. It's normal for your body to build up a tolerance to Dexedrine. This happens with all habit-forming medications when they are used frequently. People who have developed a tolerance to a medication may find that they need to take more of the drug to feel the same effect or take it more frequently throughout the day. If you use Dexedrine over an extended period of time, your body can develop a chemical dependency to it. When a dependency is formed, your body needs the medication in order to function properly, and you might experience withdrawal symptoms when you stop using Dexedrine. The treatment process begins with patient intake. During intake, the staff at the Dexedrine rehab center will ask several questions to determine the severity of your addiction. The staff also completes a medical assessment to see if you have any other conditions that need treated. Once the intake process is complete, you begin the detoxification process. During this time, you might experience withdrawal symptoms. Not everyone has withdrawal symptoms, and each person's body reacts differently. However, if you do have withdrawal symptoms, the medical staff can administer medication to help you cope with the detox process. After detox, you begin your normal treatment. Your day at the Dexedrine treatment facility will revolve entirely around your recovery. It's common for patients to attend multiple group therapy sessions per day -- usually a morning and afternoon session. You'll also have individual therapy. Most facilities offer optional church services and recreational programs that teach patients how to have fun without drugs. If you're ready to find a treatment facility that's right for you, call 1-888-341-7785. People choose to use rehab facilities that aren't local for numerous reasons. Some people are scared that their friends and family members will discover their situation if they use a local program. Other people simply think it will be easier to recover if they are far away from everything they know. If you choose not to attend a local program, you should make sure you're doing it for the right reasons. Running away from your problems doesn't solve them. If you're planning to return to your normal life, then you should consider a local program. However, if you're considering starting a new life, in a new location, a non-local program could help you. Many current substance and behavior addiction treatment facilities feature the nicest amenities you would normally enjoy in 4 and 5-star hotels, with your success and enjoyment being the primary goals. From 5-star chef-prepared meals and fine linens to gym facilities and in-house massage therapy, you can get the greatest drug, alcohol or behavior addiction treatment for yourself, your family member or your friend while relaxing in comfort. If you need support in locating the perfect luxury treatment programs for Dexedrine addiction, call our toll-free hotline as soon as possible at 1-888-341-7785. When your stay at the inpatient Dexedrine rehab facility ends, it's important to continue your recovery process. People continue their recovery in a variety of ways. Some people follow their stay at an inpatient facility with an outpatient treatment program. This is a good option if you don't feel confident enough to resume your normal life without giving into temptation. You can also join local support groups. Regardless of how you choose to continue your recovery, it's important that you know your triggers. You need to know what causes you to start using Dexedrine so you can avoid these situations entirely. Support groups and outpatient treatment programs give you the added support you need to stay sober. It doesn't matter how long you've been taking Dexedrine; it's not too late to get help. Dexedrine rehab centers are designed to help people with severe addictions fully recover. If you're ready to start your treatment, call 1-888-341-7785. Our phone lines are staffed 24 hours per day, seven days per week. What are other names for Dexedrine? Other brand names for the prescription medication Dexedrine include DextroStat, LiquADD and ProCentra. Dexedrine is also known by the name dextroamphetamine. Amphetamine and dextroamphetamine are combined to make the brand name Adderall. What are the long-term effects of Dexedrine abuse? Long-term use of Dexedrine is known to cause irritability and fatigue when you don’t have the medication. A more serious effect is hallucination, but it is rare. How do I know if I’m addicted to Dexedrine? If you’re addicted to Dexedrine, you’ll have a strong urge to use the medication and your body won’t function properly without it. People who are addicted might often find themselves thinking about where and how they will get more pills. If you need more information about Dexedrine addiction and treatment, call 1-888-716-9806.